The 11-year-old Charitybuzz was a struggling startup in 2008 when Ben Erwin agreed to work for free because his job at the online charity auction site was far more fulfilling than a previous sales position he had at a financial consulting firm. Charitybuzz, led by Broadcast.com co-founder Todd Wagner, raises funds for nonprofits through can’t-miss online auctions, often one-of-a-kind, like lunch with billionaire Home Depot co-founder Ken Langone (which benefits Finding A Cure for Epilepsy and Seizures), or two seats to Christian Siriano’s ready-to-wear show during New York fashion week, including a backstage pass and after-party access (which benefits the American Society for the Prevention of Cruelty to Animals). He eventually did help the company grow in part by shifting Charitybuzz from a site focused on offering celebrity experiences in auctions timed to coincide with the charity-ball schedule of fall and spring fundraisers into a year-round enterprise with auctions featuring a range of items that could interest almost anybody. Today Charitybuzz is part of Wagner’s Charity Network, which also includes sweepstakes site Prizeo and the Global Philanthropy Group. 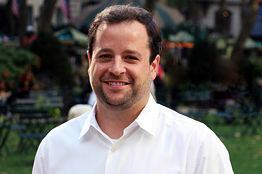 Erwin serves as president of Charitybuzz and chief revenue officer of Charity Network. One impetus for broadening out the categories of Charitybuzz items came in May 2013, when the firm auctioned a cup of coffee with Tim Cook, CEO of Apple, to raise money for the Robert F. Kennedy Center for Justice and Human Rights. The staff thought the item could draw bids of around $25,000, maybe $50,000. The winning bid? $610,000. “It was a watershed moment for us,” Erwin says. The sale revealed that bidders were as interested in meeting a well-known business executive like Cook or an activist investor like Bill Ackman (an item that raised $57,500 to benefit BYkids) as they were a Hollywood star. “You might make a deal, get great advice, network to meet somebody else,” Erwin says. Nonprofits, meanwhile, don’t typically have relationships with celebrities, but they do have boards of directors. “Those boards typically are comprised of leaders of business,” he adds. Items featuring such execs are now a key money raiser for the firm. Another surprisingly popular item that was sold in the summer of 2016—also with an Apple theme—was a motherboard for one of 200 Apple-1 Computers hand-built by Steve Wozniak at the home of Steve Jobs’ parents in Los Altos, Calif. “That’s about as far out of our wheelhouse as you can go,” Erwin says. To attract bidders, Charitybuzz took the unusual step at the time of engaging in two-to-three months of pre-auction marketing, including bringing the motherboard to a vintage computer festival to drum up interest. The final bid was an extraordinary $815,000, a result, Erwin says, that may not have been realized at a live gala charity auction. Auction items on Charitybuzz have sold for as little as $500 and as much as $815,000. Charitybuzz, which moved from Westport, Conn., to New York City in 2010, began by running auction events for specific foundations, typically in the fall and spring. The auction site has sold 10,000 individual lots since inception for more than 4,000 nonprofits in the U.S. and overseas, raising more than $300 million. To grow, the firm realized it had to spread revenue throughout the year by creating more of a year-round platform than an events business. The strategy allows them to sell as little as one lot for a nonprofit, and it allows for more strategic timing. “Since we’re not tied to physical events, we don’t have to wait until that one day where you have 500 people in tuxedos and evening gowns in a ballroom,” he says. The website also has run a series of campaigns nearly every month that it calls Curates, where several nonprofits can offer up items in a specific area like business, golf, or entertainment. By attracting potential donors interested in a topic that they are passionate about, “it lifts the performance of all the auctions,” Erwin says. Erwin points out that the percentage of the U.S. economy that goes to charity has been around 2% for decades, despite an expanding number of nonprofits. That means there is less philanthropic funding for each one. Celebrity Culture: When Did Going To Court Become A Fashion Show?